M.R.K.T. is a materials and design-focused, architecturally inspired bag maker out of San Francisco. Even better, their sale prices easily cross the impulse buy threshold. The weird thing about most backpacks and especially messenger bags, is that their size should be dictated by the primary item they’re used to carry, and it most definitely is not. 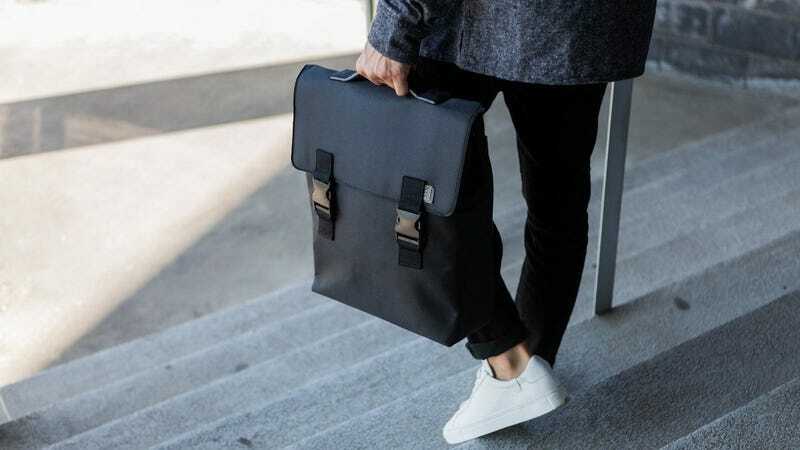 There’s certainly a time and place for messenger bags that are thick enough to double as weekenders, but how many MacBooks thick does a laptop bag need to be? Our favorite of M.R.K.T’s materials, undeniably unique, and lightweight and collapsible. The charcoal/lake blue colorway of their Manhattan Briefcase, a collaboration with The New York Times, is the first messenger to challenge for the position of my daily driver in 14 years. Hyperdense synthetic industrial felt. Provides rigidity and structure. Durable, water resistant, mildew free, and colorfast. The next evolution of canvas. Nothing discrete about these. Constructed from premium coated canvas, TARPAULIN is rugged, waterproof, and anti-UV, making it a solid option for the rigors of the daily commute, no matter what climate you are in. Cordura fabrics are known for their durability and resistance to abrasions, tears, and scuffs. The finish is a remarkably clean and premium with a slight sheen. Subtle, durable, sleek, very black. Premium leather looks without premium leather pricing or its vulnerabilities. Leather-like microfiber that is supple in texture. Clean minimalist aesthetic. Resistant to foul weather. A very cool trim that feels great and really pops against the Smrt Felt. Premium suede microfiber. With threads 20 times finer than silk, has a premium feel that provides an alternative to traditional animal suede. A bit too shiny for our taste, but can take a beating. Hyperdense synthetic industrial felt that has undergone a surface searing process to create a natural textured pattern. Has a slight sheen and is highly durable. Simple, clean, and resilient high-quality polyurethane. High level of color saturation and resistant to most stains and dirt.